BANGI, 26 Oct 2013 – Good time management and planning ahead of time ensured that both his studies and extracurricular activities were given equal emphasis. 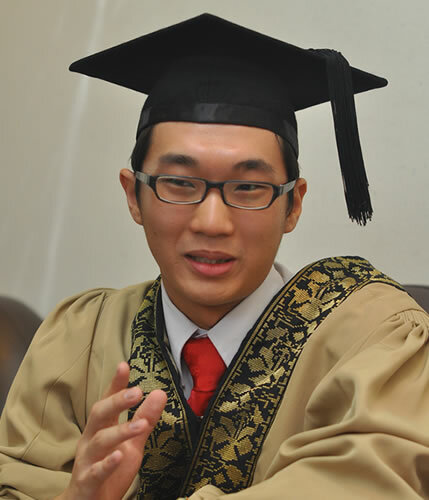 Chin Chuin Hao, the second Royal Award recipient at the Graduation Ceremony of National University of Malaysia (UKM) says that both have been the key to his success during his time at UKM. The youngest of three children, Chin is a graduate from the Mechanical Engineering Department of the Faculty of Engineering and Built Environment (FKAB) and is now working at the Favelle Farco Cranes Malaysia Sdn Bhd. Coming from humble beginnings, Chin’s father, Chin Chi Pan is a retired mechanic and his mother Goh Beng Hong, is a promoter at a supermarket. Chin said that engineering is a hard course to go through and one can easily fail if not focused. With studies and extracurricular activities, Chin developed his own method of going about his university life. “In a day, my morning till afternoon will be for classes, then after 4pm I will usually go exercising with friends, we jog or go swimming. At about 7pm I have dinner then from 8 pm till 10pm is my revision time where I finish up all my assignments and projects. I usually go to bed after 11pm. “If I have a club or society meeting, where we have to plan for an event, then I would do my revision earlier or if the meeting finishes early I would add in more time to study. That is how I plan my day and I stick to the plan,” Chin said. Chin believes that all students should have a hunger for knowledge and strive to learn more about everything around them. He said students should not feel that studying is a burden but must always have a positive attitude towards leaning or else they would not fully absorb and appreciate what is being taught to them. Talking about his award, Chin said that he was informed by his lecturer that he had been chosen to be the second recipient of the award. He admits that he was too shocked to react that his mind went blank for a few minutes. “After I regained my composure I immediately called my parents to tell them the news. They were very happy and congratulated me. I had to control myself from jumping up and down and acting crazy because I was in a public area but inside I was screaming,” Chin recollected excitedly. He said the Award is a gift to his family, especially his parents hoping that it would make them proud and repay them for all that they have given him through the years. He gave a special mention to his Lecturer and Project advisor, Prof Dr Andanastuti Muchtar from FKAB for being a great mentor and one who has taught him many things. Chin also expressed thanks to his roommate of four years at the Keris Mas Residential College (KKM) for always being a good listener and a helpful and understanding friend during good and bad times. Chin received his award during first session of the four day long Graduation Ceremony together with the first Award recipient, Nursahazweena binti Kamarudin from the Faculty of Social Sciences and Humanities (FSSK).